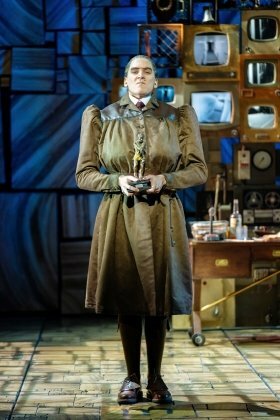 The Royal Shakespeare Company have released the first images of Elliot Harper as Miss Trunchbull in Matilda The Musical’s UK and Ireland tour. Elliot joined the production on Tuesday 15 January at Theatre Royal Plymouth. The tour will then play at the Alhambra Theatre, Bradford (19 February – 23 March 2019), Edinburgh Playhouse (2 – 27 April 2019), The Bristol Hippodrome (7 May – 8 June 2019), Mayflower Theatre, Southampton (11 June – 6 July 2019) and Norwich Theatre Royal (16 July – 17 August 2019). The West End production will continue to play at the Cambridge Theatre, where it is now in its eighth year and is booking until 24 May 2020. Carly Thoms (Miss Honey) and Sebastien Torkia and Rebecca Thornhill (Mr and Mrs Wormwood) will continue in their roles until the tour concludes its run at Norwich Theatre Royal on 17 August 2019. Elliot Harper’s West End theatre credits include Father Joe in The Exorcist at the Phoenix Theatre, Matilda The Musical (Cambridge Theatre), One Man Two Guvnors (National Theatre), Les Misérables (Queens Theatre) and The Phantom of the Opera (Her Majesty’s Theatre). Other theatre credits include Sweet Charity (Watermill), A Study In Scarlet (Southwark Playhouse), The Silver Tassie (Druid/Lincoln Center NY), Rope, Arsenic and Old Lace (Pitlochry Festival Theatre), The Big Sleep (The Mill At Sonning), As You Like It, Deathtrap, The Taming of the Shrew, The Talented Mr Ripley and Travels with my Aunt (Queens Theatre, Hornchurch), and the UK touring productions of Jesus Christ Superstar and The Buddy Holly Story. Harper’s film and television credits include Howard Goodall’s 20th Century Greats (Tiger Aspect), Showroom, which was a winning film at SXSW Film Festival, and The Egg, Masters of the Universe (Asalva Productions). 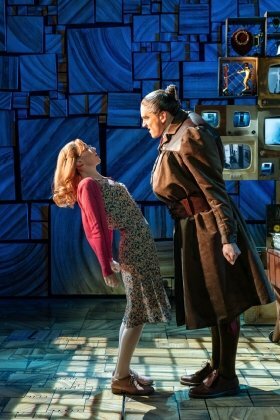 Carly Thoms as Miss Honey and Elliot Harper as Miss Trunchbull in the Royal Shakespeare Companys Matilda The Musical. The full adult cast includes Richard Astbury, Joe Atkinson, Nina Bell, Peter Bindloss, Oliver Bingham, Emily Bull, Samara Casteallo, Matthew Caputo, Matt Gillett, Michelle Chantelle Hopewell, Sam Lathwood, Steffan Lloyd-Evans, Charlie Martin, Tom Mather, Anu Ogunmefun, Carly Thoms, Rebecca Thornhill, Sebastien Torkia, Adam Vaughan and Dawn Williams. The role of Matilda is shared by Sophia Ally, Scarlett Cecil, Poppy Jones, Emma Moore and Nicola Turner. The other young performers in the UK and Ireland Tour in the three teams who play the roles of Bruce, Lavender, Amanda and the rest of the pupils at Crunchem Hall and are as follows: Evie Allen, Louella Asante-Owusu, Joseph Black, Georgia Mae Brown, Isobelle Chalmers, Jessica Chalmers, Madeline Gilby, Sheldon Golding, Cuba Kamanu, Tom Lomas, Adam Lord, Maddison Lowe, Ilan Miller, Felicity Mitson, Toby Mocrei, Ashton Murphy, Joely Robertson, Ruaridh Sinnott, Kit Swaddling, Chantelle Tonolete, Harrison Wilding and Harry Wilson. The production is accompanied by Change My Story, a new education programme inspired by Matilda The Musical which will engage young people in towns and cities across the UK and Ireland. With a travelling library of stories led by the musical’s librarian Mrs Phelps and whole school takeovers, the RSC aims to reach over 15,000 children, in collaboration with touring theatre partners. Further details can be found at http://uk.matildathemusical.com/tour/schools/matilda-school-resources/. Matilda The Musical has now been seen by 8.7 million people worldwide, having toured to over 72 cities and played more than 6500 performances in the West End, on Broadway and on tour across North America, the UK, Ireland, Australia and New Zealand. Matilda The Musical had its first non-English language production at the LG Arts Centre in Seoul, South Korea in September 2018.